This morning we found ourselves back on familiar ground, near the targets "Lismore" and "Leadhills" that we imaged back on sol 1905. Today's planning session kicked off with an important decision about where to drive and how that will set us up for exciting science over the holidays. Sols 1906-1908: Quick Geologic Transitions! Only two days ago, Curiosity was exploring a region of the Vera Rubin Ridge that appears more "blue" than its surroundings, and consists of patches of sand and clean bedrock. The majority of the time on the "Vera Rubin Ridge," Curiosity focuses on the rocks that make up the ridge, measuring their chemistry and imaging their structure to try and understand the origin of this prominent feature in Gale crater. The plan for this weekend is to finish up the investigation of Vera Rubin Ridge stop #9 and drive toward the next stop. Sol 1897-1898: Welcome to Torridon! After spending the weekend analyzing the chemistry of several interesting targets, the science team has planned yet another action-packed science investigation into Curiosity's next two days on Vera Rubin Ridge. Planning Curiosity's daily activities involves making decisions that impact not only that current day's plan, but also has ripple effects on plans for the next week or even beyond. Sol 1891: Making Do With What You Got! Even before we started planning today's activities, we knew there would be a chance that we would be limited on the amount of data returned to Earth following the previous drive. The star of tosol's plan was a drive that will likely be our last drive before the Thanksgiving holiday. There was no drive in the plan today, so the science team spent the morning identifying and working out a plan to characterize several high-priority science targets. Because the alignment of a Mars sol versus an Earth day is constantly changing, we sometimes start our planning day a couple hours earlier or later than normal. Today we planned a jam-packed 2 sols of remote and contact science as we continue our journey along the Vera Rubin Ridge (VRR). On the first sol, Sol 1870, we'll do a ChemCam observation on the bedrock target "Waboomberg," followed by some Mastcam imaging of nearby VRR features, including exposed rock layers and light-colored bedrock. It was a good weekend on Mars. Curiosity spent the weekend exploring a beautiful outcrop of sedimentary rocks (shown in the above image) as part of our continued investigation of the middle and upper parts of Vera Rubin Ridge. On Sol 1864, Curiosity successfully got a move on from her inadvertent layover stop, which presented the science team with a new workspace, and a new view of the structures exposed in the "Vera Rubin Ridge." Curiosity will finally be back on the move. The rover made an unexpected stop of nearly two weeks in the current location due to several things ranging from failed uplinks to insufficient arm heating and a camera glitch. We are starting to suspect that Vera Rubin Ridge might be cursed. After the challenges we faced last week, we were hoping for a successful weekend plan but alas, it was not to be. Following a series of setbacks this week, Curiosity is on track to have a productive, albeit stationary, weekend. Sol 1856-1857: Take two (almost)! After Monday's communications hiccup that prevented us from uplinking our two-sol plan, today we're hoping to redo most of what we had in Monday's plan. Our exploration of space, and Gale Crater specifically, is enabled by incredible technology and amazing engineers and scientists. Since the start of our investigation of the Vera Rubin Ridge, we've been primarily driving around on fractured bedrock material with a general lack of sand. Today felt like any other planning day: a straightforward plan involving remote sensing, a drive, post-drive imaging, and some untargeted observations on the second sol. The seasons on Mars are long, and even though Curiosity is near the equator, the change in weather between the seasons is noticeable and winter is coming to Gale Crater. There's a line in the halftime scene of the movie "Any Given Sunday": "life's this game of inches…the margin for error is so small." The same is true on Mars. On Sol 1843, Curiosity started her drive with a turn to the right. Sols 1841-1842: Who ever said roving around Mars was easy? After a successful plan was carried out on the previous sols, in the decisional downlink we received limited imaging data with which to work today. Unfortunately we weren't able to uplink yesterday's plan onto the rover because of a technical issue with the DSN, so we spent sol 1835 in run-out. Today we worked very hard to generate what we affectionately dubbed a "Frankenplan," which is defined as a plan in which one mashes elements that were already prepared (the contact science we had hoped to do on sol 1835) with new elements (a drive). Over the weekend Curiosity worked on a bold plan to drop off a sample in the inlet of the CheMin instrument. Sol 1831: Quite a Diffracting Weekend! The science team has been waiting quite a long time for this moment. Back in late March, nearly 180 Mars-days ago and when Curiosity was investigating the last stretches of the Bagnold Dunes before continuing towards Vera Rubin Ridge, Curiosity's scoop gathered a sample called "Ogunquit Beach." As was predicted in yesterday's blog, we have officially left the "Bar Harbor" quadrangle and are now into the "Kuruman" quadrangle. Before landing, Curiosity's landing ellipse and the foothills of Mt. Sharp were divided up into quadrangles - squares ~1.5 km on a side - to give science team members reasonable amounts of terrain to work with during pre-landing geological mapping, and provide the source of the target names within that quadrangle. Just when we thought we were going to leave this spot on Mars, we found ourselves stuck here for yet another sol. This time, a fault during one of our arm activities caused us to lose our plans for the past two sols and we were in recovery mode again today. At times, it seems like fantasy that we have a nuclear-powered car exploring Mars and that I get to help that exploration, including today as the Science Operations Working Group Chair. Sol 1823: "Will you come with me, sweet Reader?" Curiosity continues her traverse across the lowermost portions of Vera Rubin Ridge, where she continues to investigate the interesting rock textures and colors ahead. Sol 1822: Onward and upward! Communication ties our lives together. If phone or internet service goes out in our area, sometimes we have to put our lives on hold for a few minutes or a few hours. The same is true for Mars operations. Curiosity's weekend "Brushfest" (link to Ken's weekend blog) paid off, revealing the stunning purple color of the rocks of this part of the Vera Rubin Ridge (VRR) hiding below the veneer of dust on their surfaces. We are planning only 2 sols today because there will be a soliday on Sunday to get us back in sync with "Mars time" in Gale Crater. As we've seen from the past several weeks and months of imaging, Curiosity's approach to and ascent of the Vera Rubin Ridge (VRR) has provided us with stunning views of the Mount Sharp terrain. Curiosity is on the steepest part of Vera Rubin Ridge that it will encounter along its climb. The machine is performing superbly, having driven a 28 meter distance yestersol and having climbed 18 meters vertical elevation in four planning sols. Perhaps this long Labor Day weekend, you will find yourself on a hike that ends with a particularly steep stretch. On such a steep trail, you will simply want to concentrate on reaching the top of your destination and not be required to perform any other tasks. Curiosity's drive on Sol 1801 brought us to an excellent location for some contact and remote science in today's 3-sol plan (setting up for a long Labor Day weekend). We'll kick off Sol 1802 with contact science (MAHLI + APXS) on the target called "Tyler," a region of Murray bedrock just in front of the rover. Curiosity drove 23.3 meters over the weekend, bringing us even closer to the area we will ascend Vera Rubin Ridge. We have reached the point in the traverse where we are no longer headed east along the ridge, but instead are turning to the south where orbital data show the ridge has slopes shallow enough for Curiosity to climb. Yesterday's drive went perfectly, putting us in a good position for a busy weekend plan. Curiosity will start off on Sol 1797 with a long (2h 45m) science block full of a variety of remote sensing. Curiosity completed a 30.3 meter drive yestersol, climbing another 2.4 meters in elevation. The rover is still in a soil-dominated region near the base of "Vera Rubin Ridge." Curiosity is now tantalizingly close to climbing up Vera Rubin Ridge. For the past several weeks we have been skirting around the ridge, documenting sedimentary structures and bedrock composition along the way as we work toward our intended ascent route. After the excitement of a mid-planning solar eclipse yesterday, today was pretty uneventful! We had a nice long pre-drive science block which we stuffed with 2 ChemCam observations to measure the chemistry of targets "Boiler" and "Biljim" as well as a ChemCam image mosaic of the Vera Rubin Ridge. Not to be overshadowed by other goings on in the solar system today, we planned a full day of activities for Curiosity. Even though Curiosity did not drive the planned 15 meters yesterday evening (she only made it about 11 meters), she moved far enough down the road to get in good position to acquire a full high-resolution mosaic of Vera Rubin Ridge (VRR) over the weekend, which was the hope for yesterday's drive. As Curiosity inches closer towards ascending Vera Rubin Ridge (VRR), the science team is continuing to be diligent in both characterizing the local surroundings while also looking ahead and imaging the ridge upon approach. I was the Surface Properties Scientist, or SPS, on staff today. After completing a successful drive back to the strategic route to continue up the Vera Rubin Ridge, we arrived at a workspace filled with sand and a lone rock outcrop dubbed "Dumplings Island". I had a busy day as the ESTLK. At the start of operations, we discovered that the drive yestersol faulted prematurely after about only 15 m, which was roughly half the expected distance. MSL drove over 32 meters last weekend, to a sandy area with a few bedrock blocks, but ChemCam suffered an anomaly and was marked sick after the acquisition of the first RMI mosaic of Vera Rubin Ridge. The instrument is in a safe state and turned off, but no other ChemCam observations were successful last weekend. For this three sol weekend plan, Curiosity sidled up to the base of the Vera Rubin Ridge (VRR), whose proximity is evidenced by the 12 degree upward tilt of the rover's parking position, for an extended suite of imaging of the ridge and its surroundings. Sol 1782 Blog: Touch and go, two days in a row! Lately, one of our biggest science objectives is to conduct bedrock APXS measurements with every 5-meter climb in elevation. Sol 1781 Blog: Dusting off the wheels and hitting the road! Following our month of conjunction and first full day of operations on Monday, we're finally ready to dust off the wheels and get back to driving towards Vera Rubin Ridge. Today was a pretty smooth day of planning, as we're still getting back into the swing of things. Welcome back to the first full day of operations after conjunction and the fifth anniversary of landing! Curiosity remained healthy over the month long break, so without missing a beat, Curiosity is ready to resume the Vera Rubin Ridge imaging campaign and the trek up Mt. Sharp. As the solar conjunction stand-down comes to an end, we are easing back into operations planning, focusing on Sol 1780, which will be planned in detail on Monday. Today marked the last chance for us to reliably command Curiosity before she, and Mars, disappear behind the Sun for nearly a month. Planetary scientists take their vacations when the planets align. In our case it is because communications with Mars are blacked out when the red planet goes behind the sun. It is called a solar conjunction. Today on Mars we planned a typical "drive sol" that involved a bit of pre-drive science followed by a drive and some post-drive untargeted observations. The activities planned for Sol 1753 revolve around a quick "touch-and-go" chemistry measurement using the Alpha Particle X-Ray Spectrometer (APXS) instrument on Curiosity's arm. Following a jam-packed weekend of contact and remote science on some beautiful sand deposits, the GEO group opted for mostly remote observations in today's plan. ChemCam will target "Grogg Ledge," a small patch of Murray bedrock in front of the rover. Curiosity has intentionally scuffed a nearby sand ripple, which has gifted the team with an exceptional view of the interior of these small sand deposits. Another touch-and-go was strategically planned for today, and there is bedrock in the arm workspace, so the tactical science team selected a block named "Tupper Ledge" for contact science. As is typical for Curiosity lately, today we planned a "touch-and-go" suite of activities for the rover. Today I served as the Science Operations Working Group Chair. I was the Surface Properties Scientist, or SPS, on staff again today. After completing a successful drive, Curiosity arrived at a nice workspace to carry out the weekend plan. Sols 1741-1743: "Cat Sized Island"
Last evening (June 27) between 8pm and 9pm PDT, Curiosity drove approximately 34 meters to the east to position herself just north of a large field of ripples on her way closer to ascending the iron oxide-bearing Vera Rubin Ridge. This past weekend, Curiosity continued to journey east along the contact between the lower portion of Vera Rubin Ridge and the Murray formation with a drive that was a little over 20 m long. Today we worked on planning two sols, Sol 1739 and Sol 1740. Curiosity has presented us with another beautiful workspace following a 16.6 meter drive. The majority of this week's activities were focused on imaging Vera Rubin Ridge to observe its stratigraphic and structural relationship to the underlying Murray formation. Curiosity continues to drive to the east-northeast around two small patches of dunes that are positioned just north of Vera Rubin Ridge. As this is my first time contributing to the MSL blog, I'd like to quickly introduce myself to you all. I'm Mark, an MSL Participating Scientist and a faculty member at Northern Arizona University, trained in geochemistry, spectroscopy, and remote sensing. I'm excited to help walk you all through the daily endeavors of this wonderful rover and mission! The drive on Sol 1728 was successful, and our weekend plan will be chock-full of activities. After a busy day of contact science yesterday, today's plan was dedicated towards remote science and driving. 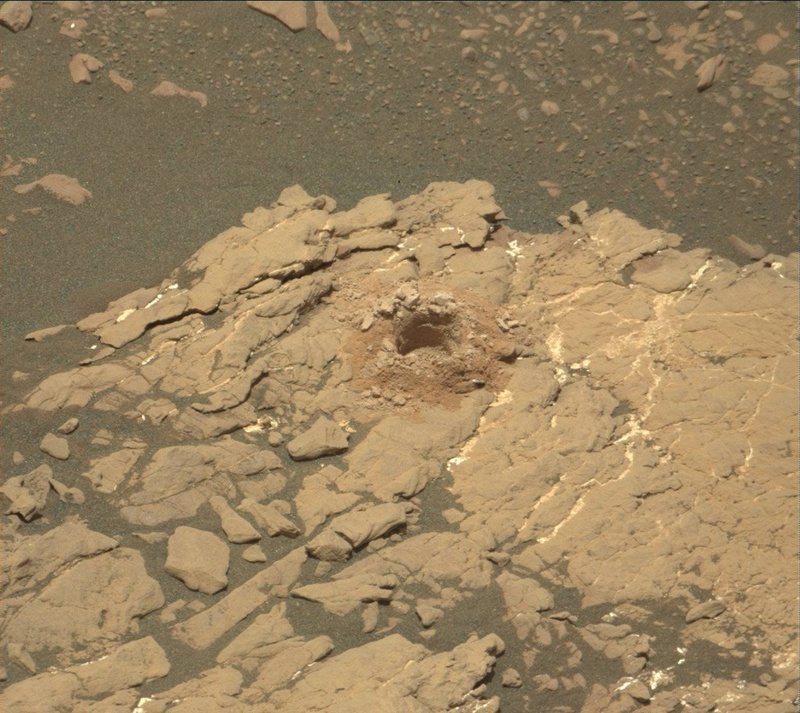 As Mastcam PUL-1 today, I was fairly busy helping put together a suite of Mastcam images for Curiosity to take. After a successful drive, our parking spot included a nice patch of Murray bedrock to allow us to perform contact science (MAHLI and APXS) in today's plan. After great anticipation over the last few weeks, the drive in the current plan will bring us into position for stop 1 of our close look at the northern face of the hematite-bearing Vera Rubin Ridge. On most weekends, Curiosity dedicates part of her efforts to do contact science - deployment of APXS, MAHLI, and sometimes the DRT - because multi-sol weekend plans have more time and power to fit in these more complex activities. Today, as I served as the Science Operations Working Group Chair, we prepared a 3-sol duration plan to keep Curiosity busy over the weekend. MSL drove 26 meters on Sol 1720, as planned, to a location with blocks of bedrock in the arm workspace. The SPS has an interesting job, in that the SPS helps Rover Planners (called RPs) assess the terrain around the rover with safety in mind, first and foremost. Sol 1719: Wait and Hurry Up! Today was an interesting day of planning: because of an issue with the computer system responsible for processing data once it is received on Earth, Curiosity's images and other data from Sol 1718 didn't arrive until well into today's planning. We are beginning to turn toward the east and southeast as we approach Vera Rubin Ridge with the Curiosity rover. After a busy and successful plan over the weekend, we weighed our priorities between using APXS to study the bedrock we’re driving over or drive farther along our path. Curiosity left no stone unturned, unshot or unbrushed as she wrapped up observations at the stand of gray-toned rocks she arrived at on Sol 1712. Unfortunately the Sol 1713 activities were not uplinked due to an issue at the DSN station, so today's plan is focused on recovering the activities that were planned yesterday. Tosol on Mars was one of those sols where we simply did not have enough hours to get everything done that we had wanted to do. Despite the holiday weekend, the science and engineering teams were greeted with a plethora of data from Curiosity when they started planning Sol 1712 - like your birthday and your favorite winter (gift-getting) holiday rolled into one. Curiosity continues to drive through an otherworldly jumble of in-place bedrock, tilted rocks, sand with small ripples, and local pebbly debris piles. Vera Rubin Ridge continues to loom larger in the rover's forward view, although progress is somewhat slow due to the difficult terrain. Yestersol's drive was 16 meters. After a 14.6 m drive, the GEO group decided against arm activities due to a lack of compelling targets and in deference to making the next drive longer. Curiosity is continuing to make progress towards Vera Rubin Ridge along the Mt Sharp ascent route. The rover planners parked us in front of the one slab of outcrop - an island among ripples of sand - we could safely drive to from our Sol 1700 position, setting us up to continue our exploration of the Murray formation. Curiosity continues towards Vera Rubin Ridge with a 48 m drive. The road to Vera Rubin Ridge, a feature believed to be enriched in the mineral hematite, is getting steeper, so we are stopping frequently to study the composition of the bedrock beneath our wheels. Curiosity continued her detailed investigation of the interesting suite of outcrops we have been picking our way across during the last week. Sols 1693-1694: Remote science and onward! Today we planned two sols, 1693 and 1694. On the first sol, we will conduct a suite of remote science observations before driving away and resuming our trek up Mount Sharp. After the drive on Sol 1691, the workspace in front of the rover had plenty of interesting rocks in front of us to keep us busy. The weekend drive stopped a little bit short of the target, but that's ok because it put the rover in reach of some interesting cross-bedded rocks. Today was a Friday so we put together a three day plan to cover the weekend activities, or in Mars-speak, sols 1688 - 1690. Sol 1687: Mega-science at a megaripple! The rover planners executed another great drive to park us in front of a megaripple in order to study its physical and chemical characteristics. Continuing the steady march up Mt. Sharp, Curiosity drove 18.3 m to bring us closer to a series of features being called megaripples, which are darker and larger ripples than were seen on the Bagnold Dunes. Sol 1685: Touch and Go or Just Go (Again)? Planning rover science activities is a dynamic process. Sol 1684: Touch and Go or Just Go? Today was a day of tradeoffs. Should Curiosity focus on driving to get to a higher priority target sooner, or conduct contact science at the current location? After a drive of almost 29 meters, we are parked at a site suitable for a busy plan full of contact science on the Murray formation. After a 30 meter drive on Sol 1679, we find ourselves near diverse outcrops of the Murray formation. Our drive yestersol went as planned and added another 28.3 meters to Curiosity's odometer. MSL drove another 33 meters on Sol 1677, and again is surrounded by rocky outcrops partly covered by dark sand. This morning we woke up to fresh images from Curiosity that showed our surroundings after an ~17 m Sunday afternoon drive. In the Sol 1673 drive, the rover planners aimed us for a nice curb of Murray bedrock which we could investigate with targeted science (with Mastcam and ChemCam) and contact science (with APXS, MAHLI and the dust removal tool (DRT)) over the weekend. There's nothing like a day of technical difficulties to make you appreciate when it all works! Sol 1672: If it weren’t for the last minute, nothing would get done! On Tuesday, the science team had a "soliday", a day without planning to allow the time when the science team plans activities on Earth to realign favorably with when the rover is ready to accept and execute those plans. Today I covered the ChemCam Payload Element Lead (PEL) role for this first Monday after Easter. Our latest drive put us in position in front of the interesting"Moosehead Lake" outcrop with lots of veins and grey patches: plenty to keepCuriosity busy over the weekend! The Sol 1668 plan starts off with a nice longscience block. The Sol 1664 drive was halted after the rover had driven less than 2 meters because the angle of the left bogie slightly exceeded the suspension limit. MSL drove about 24 meters on Sol 1662, and another drive isplanned for Sol 1664. Our drive away from the "Ogunquit Beach" sand dune location went well, taking us about 35 meters to the southwest and putting us in a good location to continue measuring the composition of the bedrock as we drive up Mt. Sharp. Curiosity has been carrying out a great investigation at Ogunquit Beach, but we’re still working out some issues related to the drill feed, so the decision was made to drive away in today’s plan. Sols 1657-1658: April Fool's Day, or Groundhog's Day? Today’s three-sol plan starts with MAHLI imaging of the first scoop location (OG1). Sol 1651 activities executed nominally, so today’s plan is focused on dropping off the fine-grained portion of "Ogunquit Beach" Scoop #1 (now named "OG1") to CheMin, and SAM analysis of OG1. Sol 1650 activities completed as expected, so it’s time to start scooping. The traction control test went well, and MSL drove over 30meters on Sol 1646. MSL drove a little over 20 meters on Sol 1645, toward the bigsand dune to the east that is the subject of a science campaign thatwill hopefully start next week. The APXS will still be deployed on The Hop early on Sol 1645, and to avoid using battery power to heat up the arm, we'll wait until early afternoon to move it out of the way. Sol 1640-1642: Better Late than Never! Sorry for the delayed posting! In the rush to get ready forthe Lunar and Planetary Science Conference (LPSC), I forgot to post about the sol 1640-42 plan. MSL drove about 28 meters toward the south on Sol 1642 andagain is in an area with Murray Formation bedrock blocks surrounded bydark sand. Today we are continuing our investigation of Stop #3 of the Bagnold Dune campaign. Yesterday’s short drive was successful, so we started todaywith the rover parked at stop #3 of the dune campaign and the rover’s arm up inthe "ready out" position. MSL drove about 29 meters toward the south on Sol 1632, and is in a good position for weekend activities. Sols 1632-1633: Contact science on "Spring Point"
The MSL rover drove a little over 40 meters on Sol 1630, to a place with bedrock blocks surrounded by dark sand. Good news: the MAHLI cover was successfully opened and the instrument is marked healthy again. We’re still at the second stop of the Bagnold Dune campaign, running a few more MAHLI diagnostics and focusing on targeted remote sensing. Today’s two-sol plan is devoted to MAHLI diagnostics and remote sensing. We are wrapping up our observations at stop #2 of the secondBagnold dunes campaign. The drive planned for Sol 1616 halted early, apparently because the right rear wheel got stuck between two rocks. The Sol 1612 drive went well, and there is a nice bedrock block in the arm workspace. After a 23-meter drive on Sol 1611, MSL again ended up in an area with many bedrock blocks partly covered by dark sand. MSL drove almost 27 meters on Sol 1610 to a location with severalpotential targets , so the planning team spent some time discussingpriorities. The activities planned for Sol 1609 went well, and MAHLI focus data indicate that high-resolution images of Perry were successfullyacquired. MSL drove a little over 9 meters on Sol 1608, to get the vehiclecloser to Ireson Hill and the dark blocks that have rolled down from the top of the hill. Our drive on Sol 1605 was successful, putting us in a goodposition for weekend science on the northeast side of Ireson Hill. On Sol 1604 we wrapped up at the first stop of this secondphase of the Bagnold Dune campaign. The weekend plan went well and today we begin the secondhalf of the campaign to study the "Bagnold Dunes". Wow, 1600 sols on Mars – that is quite an accomplishment! And we’re at an exciting point in the traverse as we approach the next segment of the Bagnold Dunes. The drive on Sol 1598 went well, and Curiosity drove ~21 m to the southwest, providing a great view of "Ireson Hill," seen in the above Navcam image. Over the weekend, Curiosity drove an additional ~ 26 meters to the southwest, as we prepare for another investigation of the active sand dunes. Sols 1593-1595: Dead River, Misery, and Boil Mountain? Looks like the team had some fun using the less desirable names for rock targets in today’s plan! These are all named after rock formations and geologic features from Bar Harbor, Maine. The Sol 1589-1590 plan went well, with a successful ~31meter drive. This week most of the Curiosity team is headed out toCalifornia for a team meeting. MSL drove another 13 meters on Sol 1585, again placing the rover in a good position for contact science. After a 31-meter drive on Sol 1584, MSL is in position for contact science on a block of bedrock in front of the rover. On Sol 1583 Curiosity drove 16 m, which set us up for touch-and-go contact science today. After a 25-meter drive on Sol 1578, MSL is surrounded by more dark sand than usual, but there is enough rock exposed that we had a lot of science targets to choose from today. Curiosity had a successful drive of 45 m on Sol 1577. MSL drove almost 30 meters on Sol 1576, stopping in a location with a nice exposure of bedrock in the arm workspace. MSL planning started 2 hours later than usual today because the Sol 1575 data needed for planning weren't expected until almost 10 AM PST. After a 25-meter drive on Sol 1574, MSL again has bedrock exposed in her arm workspace. MSL drove nearly 17 meters on Sol 1571, to a location with bedrock outcrops in the arm workspace. The investigation of Old Soaker continues to go well, so we'replanning to drive away on Sol 1571. The MSL operations team is back at work after the holiday break,planning Sol 1569.